Will Power put down the quickest lap of the weekend to pace a “spot-on” podium sweep for Team Penske Saturday during qualifying for the Rexall Edmonton Indy. Power, Ryan Briscoe and Helio Castroneves will start 1-2-3 when the green flag drops shortly after 5 p.m., EDT, for the 95-lap/186.2-mile IndyCar Series event on the Edmonton City Centre Airport circuit. The race will be telecast live in High Definition by VERSUS. Power earned his second PEAK Performance Pole Award with his lap of 1 minute, 1.0133 seconds (116.414 mph) during the Firestone Fast Six session around the 1.973-mile, 14-turn circuit. Power also qualified on-pole on the Streets of Long Beach earlier this year. 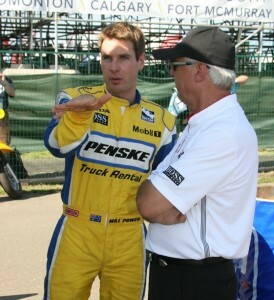 He has been involved in the Firestone Fast Six during each race he has participated in. Power’s pole-winning lap was run during the final minute of the 10-minute shootout format that sets the first three rows of IndyCar road/street races. Briscoe, last year’s pole-sitter in this event, recorded his second front-row start in the past three street/road events with a time of 1:01.1232/116.205 mph in the No. 6 Team Penske Dallara/Honda. Team Penske’s Castroneves (1:01.2033/116.053 mph) will be joined by Scott Dixon (1:01.2046/116.050 mph), the defending event champion, in Row 2. Castroneves posted his best qualifying performance on a road or street course this year. His previous best was eighth at Long Beach in his belated first start of 2009. Dixon, driver of the No. 9 Target Chip Ganassi Racing entry, continued an amazing streak that has seen him qualify in the top-10 for every race this season. Graham Rahal (1:01.952), driving the No. 02 McDonald’s car for Newman/Haas/Lanigan Racing, and IndyCar points-leader Dario Franchitti (1:01.8344) will share Row 3. Danica Patrick, who was involved in a crash during practice Friday with Dan Wheldon, will start 20th in the 23-car field after a top lap at 113.611 mph in the No. 7 Boost Mobile/Motorola Dallara/Honda.